The property and grounds at Third Haven are in generally good repair. At the start of 2015, Property and Grounds got a new clerk and a largely new membership. The legacy issues that we started the year with were the Common Room renovation, and a handicap access ramp for the old Meeting House. The new committee took up the handicap access ramp and asked that a group be convened to more closely specify what was intended for the Common Room renovation. The Meeting convened an ad hoc committee for that purpose. Our committee member, Bob Wack, undertook a review of the regulatory constraints on "Green Burials" in Maryland and the County at the request of a Third Haven member. He found that there do not appear to be regulatory constraints and that if one wished to have a green burial at Third Haven, if Third Haven Monthly Meeting agreed to such a burial, there are no apparent reasons for this not to happen. We identified repairs to the Brick Meeting House which Third Haven Trustees agreed to help us with, including: plaster work in the Meeting Room and entrance stairwell, replacing the wainscoting on the south wall of the meeting room and replacing some of the equipment in the BMH toilet room. These repairs were made by Daffin Builders who did an excellent job on all of them with the possible exception of the sink in the BMH toilet room. In that event, our friend Winslow Womack finished the repair. Winslow had previously done a lot of plaster repair in that room. In fact, Winslow has helped to maintain several different parts of our property. His help is acknowledged with gratitude. In the Spring, we had a clean-up day that focused on getting the old Meeting House ready for use, cleaning the grounds of winter debris and working on the vines. This clean up was well attended and included visitors from Adelphi Meeting who want to create a common room for their meeting. The Adelphi Friends worked right alongside us clearing vines and detritus and their help is much appreciated. After our work, we ate together. Over the summer, the committee came to agreement regarding the ramp for the OMH and handicap accessible bathrooms in the Common Room. We adopted a design for the ramp that was very similar to what had been agreed earlier by P&G but which had languished over the interim. We took that plan and a design for making the Common Room bathrooms handicapped accessible to Meeting for Business in September. 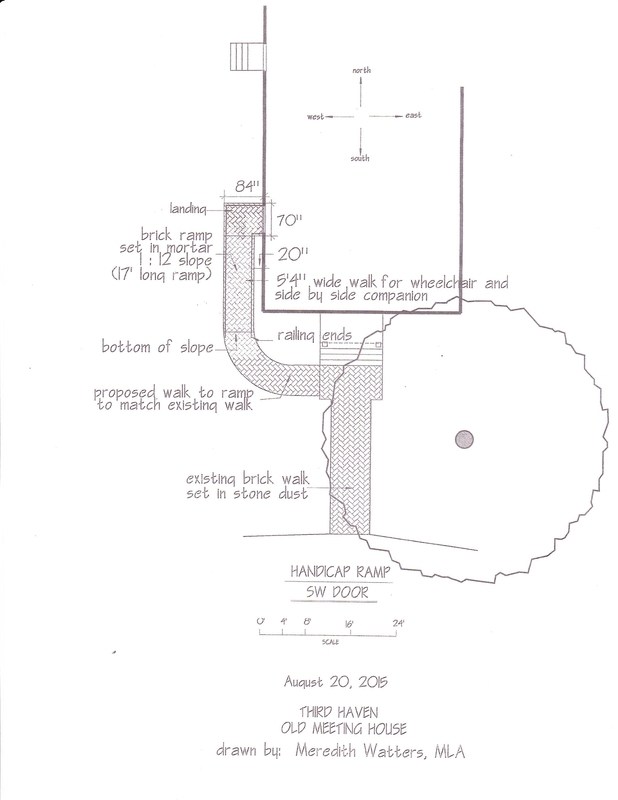 The Meeting agreed that we should submit our plan for the ramp to Maryland Historic Trust for approval and that we should obtain bids for doing the alterations to the CR bathrooms. We have since submitted a request for alteration to MHT and solicited bids for the work in the bathrooms. Meredith Watters and Mark Beck did the layout and design work for the OMH ramp. 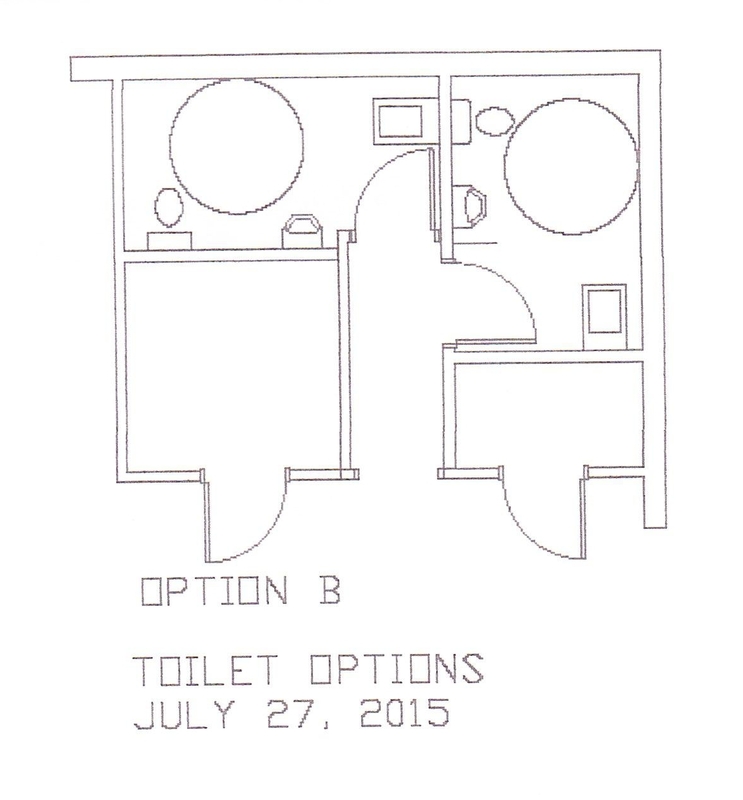 Mark Beck did the work on the design and layout for the Common Room bathroom renovation. Their drawings and assistance were essential to the progress that we have made. Additionally, Larny Claggett solicited bids for the bathroom access and Robert Gladney did the early research on what was required under the ADA. Everyone's contributions are appreciated. In the fall, following completion of the repairs to the BMH, we had a clean-up day dedicated to cleaning residual effects of the summer repairs and cleaning the windows. The rain broke for this event. It was well attended and it was just in time for us to hold Meeting there the following day. Going into the next year we will continue to advance the handicap access issues and we will continue to work with the Meeting and the ad hoc committee on Common Room renovations to figure out what the next step is, there. We have also taken up the issue of the plant assemblages behind the row of hollies, asking whether we do not want to better manage this space as a more amenable natural area.